I've searched and read threads that touch on this topic in this forum, but I still lack the info I need to understand and fix this system. I bought a used replacement motor thinking mine ('76) was bad because it was not responding to the switch. I checked voltage on both leads when the switch is in both positions and get 12.24v (grounding to body). Then I put my tester leads on blue and yellow, and get 12.24v and -12.24v in the switches forward and reverse positions, which I saw in another thread, and I think makes sense because the change in direction of the current is required to turn the motor different directions. So far, this has me concluding that all is well at the leads in the car that the motor plugs into. I got the replacement and installed it, and same thing, no motor turning (not even humming or trying turn). So I was wondering if the replacement motor was bad. Was sold to me as tested good. I took the motor out and connected each lead to one of the terminals on the battery. The motor turns. Reversed the leads on the terminals, the motor turns the other way. BOTH motors work when tested this way. Is this a legitimate way to test these motors? I CANNOT get the motors to turn if I ground the motor body to (-) and connect one or the other of the leads to (+), which was how I expected things to work. I also ran a lead directly from the (-) bat to the motor when testing with power from the leads in the car in the mounted position just to guarantee the ground. So I'm at a dead end, don't know what to think. Anyone care to share their experience? Have you checked the voltage or for voltage at the motor leads in the back roof? In my long-winded way, I tried to say yes, I did check the leads at the back where the motor plugs in, thanks Bruce. 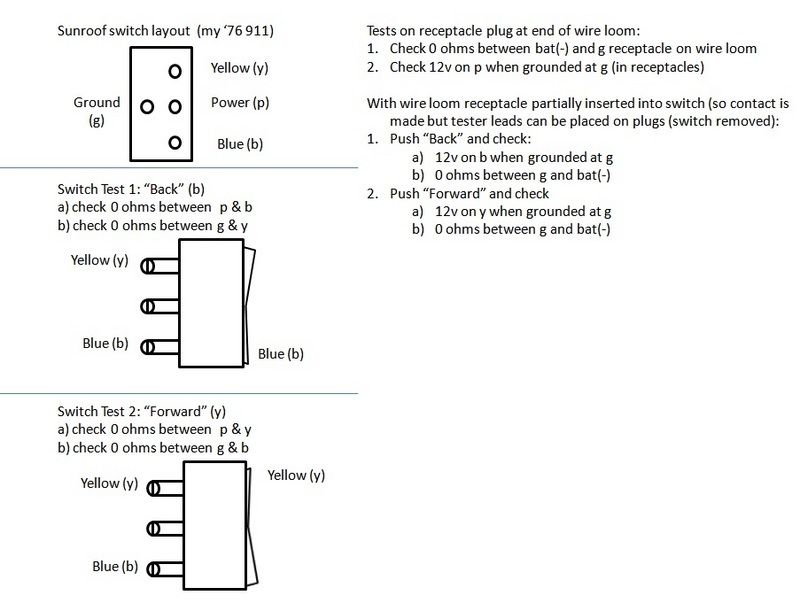 After thinking about this more, what I really need to know is whether activating the switch (say blue) is SUPPOSED connect the opposite lead (yellow) to the ground wire leaving the switch. If so, then the test I described above would be a legitimate simulation. If not, I have no idea where to go. Next chance I get (Sat) I will test by grounding blue/yellow to the body while powering yellow/blue. If that turns the motor, then I will test the switch with a continuity tester between the non-powered lead and the grounding point of the wire exiting the switch. I am having the same issue as you do. How did you remove the switch from the dash? While the motor was still attached to the roof, did you try to connect the yellow and blue wires to a battery and see if the sunroof would operate? To remove the switch, get a thin flat-head screwdriver and pry the clip back (on the trunk side) enough to release the switch and push it out into the interior. My air handling unit is removed, making this pretty easy. Not sure if you can see it with the air handler in place. I tested the switch with an ohm-meter to verify it's operation. I'm attaching a write-up of what I did to test. Unfortunately I haven't solved my problem with all this testing, but me and another fellow were sure scratching our heads over the failure to get the motor to turn via electricity flowing thought the loom, given all these tests checking out. Maybe a veteran on this board will look at these tests and tell me where my thinking is out of line. I'll definitely get back to this thread after I have a chance to return to this issue.